It is extremely important that we know what we believe and why. In this lesson we will consider the vital doctrines of the Word of God. Doctrine simply means teaching, and we are considering what the Word of God teaches about fundamental and basic truths. To honor the Lord, we must have convictions about these truths. Knowing these doctrines will help stabilize your Christian life. I recommend that you acquaint yourself with these truths. 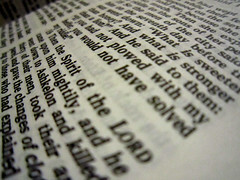 We believe in the Bible as the verbally (every word) and plenary (completely) inspired Word of God. By its being inspired, we mean that the Bible is literally breathed of God. It is God’s Word. All portions of Scripture are equally inspired and contain no contradiction. They are totally without error as originally given by God. Therefore, the Scriptures are our only infallible and authoritative rule for faith and practice (2 Timothy 3:16, 17; 2 Peter 1:20, 21; Psalm 119:89). The canon of Scripture, comprised of the sixty-six books of the Bible, is complete. Nothing shall be added to it or taken from it (Revelation 22:18, 19). We believe in the one Triune God. He is personal, spirit, and sovereign. He is perfect, infinite, and eternal in His being, holiness, love, wisdom, and power. The Godhead eternally exists in three Persons: the Father, the Son, and the Holy Spirit. These three are one God, having the same homage, confidence, and obedience. God is absolutely separate and above the world as its Creator; yet He is everywhere present, upholding all things (Genesis 1:1, 25; John 1:1; 14:16, 17, 26; Matthew 3:16, 17; 1 Timothy 3:16). We believe that the Holy Spirit is God, and therefore the third Person in the Trinity. In Acts 5:3, 4 Peter told Ananias that he had lied to the Holy Ghost; and then he said, “Thou hast not lied unto men, but unto Godth (Isaiah 7:14). He was begotten of the Holy Spirit, not having a human father, and is true God and true man. He is man’s only hope of salvation, having shed His precious blood on the cross for our sins (1 Peter 1:18, 19; Hebrews 9:26-28). He died, and buried and literally rose bodily again from the dead on the third day for our sins according to the Scriptures (1 Corinthians 15:3, 4). He is at the right hand of God today as our Mediator, interceding for us (1 Timothy 2;5, 6). He will return for us, His church, the body of Christ, and take us unto Himself into Heaven (! Thessalonians 4:13 – 18). He will set up a millennial reign on earth (Isaiah 9:6, 7; Revelation 20:4-6)..” In this we see that Peter stated clearly that the Holy Spirit is God. The Holy Spirit is a Person. In John 16:13, 14 and in other verses, a personal pronoun is used of the Holy Spirit. Romans 8:27 states that the Holy Spirit has a mind. First Corinthians 2:11 reveals that the Holy Spirit has Knowledge. Romans 15:30 speaks of “the love of the Spirit.” Also, 1 Corinthians 12:11 states that the Holy Spirit gives gifts according to His will. You see, the Bible teaches that the Holy Spirit is not just an influence. He is a Person at work in the world today. His ministry is many-fold. I will mention some of the ministries He has had in the past and does have now. 1. In the past. He is the Author of the Word of God. 2. In the past. He took part in creation. 3. Today the Holy Spirit indwells the body of the believer. a. Conviction in the hearts of the unsaved to bring them to Christ (John 16:8-11 — The word reprove in John 16:8 means convict). b. Regeneration of the believer (John 3:5, 6; Titus 3:5). c. Baptism of the believer into the body of Christ (1 Corinthians 12:13). d. Sealing of the believer — making each believer eternally secure (Ephesians 1:13; 4:30). e. Teaching the believer the truths of the Word of God (John 14:26; John 16:13; 1 John 2:27). f. Sanctifying by developing holy fruit in the life of the yielded believer (Galatians 5:22, 23). g. Empowering the believer for service (Acts 1:8). h. Filling the believer to live and serve the Lord with power and blessing (Ephesians 5:18). To live to the glory of God, every believer should rely on the power of the Holy Spirit. We need to know the truth concerning Him and then rely on His power. The Bible teaches that all men are sinners, that they are, by nature and by choice, sinful. Man, who was created by a direct act of God, made in His image and likeness (Genesis 1:27), fell in sin in the Garden of Eden (Genesis 3). Because Adam — the father of the human race — fell, all humanity has been born with a sinful nature. The only One ever born of woman who held no sin is Jesus Christ, the Son of God. Sin and death passed upon all men. Therefore, mankind is universally sinful. Read also Romans 3:9-12, Isaiah 53:6, and Ecclesiastes 7:20. Because of his sin, man is alienated from the life of God (Ephesians 4:18) and is outside the family of God (Ephesians 2:12). Unsaved men abide under the wrath of God (John 3:36) and are unable to save themselves. The Bible teaches that salvation is by God’s grace through the believer’s faith and is without works. Salvation is a free gift (Romans 6:23) and cannot be merited or secured by man in any way except by faith alone in the Lord Jesus Christ (Romans 3:19-24). Salvation was purchased by the blood of Christ. In Christ, believers have eternal life as a present possession and are justified before God. Believers are sons in the family of God (John 1:12; 1 John 3:1). The saved are eternally secure in Christ (John 6:37; 10:27-30; 1 Peter 1:5). When a person is saved, he is a new creation. His salvation affects his whole life and personality (2 Corinthians 5:17). As a believer, you will be wise to recognize the reality and power of Satan. Thank God, though he is powerful, he is not all powerful, Satan was defeated and judged at the cross; therefore, his eternal doom is certain and believers can have victory over him. Satan can come either as a roaring lion (1 Peter 5:8) or as an angel of light (2 Corinthians 11:14). The saved are able to overcome him by the blood of the Lamb, by the word of their testimony (Revelation 12:11), and by the power of the indwelling Holy Spirit (1 John 4:4). God’s people should live holy lives with good works, not to bring salvation, but because of salvation. The good works of a Christian should be the normal fruit of a saved life (Ephesians 2:10). The Bible teaches there is a place called Heaven for the saved and a placed called Hell for the lost. The Bible teaches that at the close of the church age, the Lord Jesus will descend from Heaven to call out the believers. The Lord Jesus will reign as King for 1000 years. The Bible teaches there will be a resurrection of the saved and a resurrection of the unsaved. The saved are raised to life and the unsaved to eternal doom (John 5:29; Daniel 12:2). It is the responsibility of Christians to be watching for the appearing of our Lord Jesus Christ. For lessons 12 and 13 our assignment will be to read through Romans. Someone has said that Romans is a little Bible presenting a complete message of salvation and the Christian life. Under section 2 of “NOTES” on a separate sheet, please record truths you find concerning doctrines from your reading of Romans 1 — 8. 2. Note the three persons in the Godhead from Matt. 3:16, 17. What do these verses indicate concerning the working together of each member of the Trinity? 3. List at least four truths concerning Jesus Christ, the Word, from John 1:1-14. 4. What is the lost man’s condition according to Ephesians 2:1-3? 5. Salvation comes by God’s _______________ and through man’s _______________________ (Ephesians 2:8, 9). 8. Give the descriptive names of Satan as found in Revelation 12:7-12. 9. Give some truths about Hell found in Luke 16:19-31.